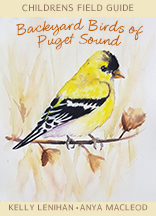 Backyard Birds of Puget Sound is a helpful guide for young children who want to attract avian visitors and how to best support the species commonly found in backyards. This guide includes 70 beautiful color illustrations of the most frequently observed backyard birds with notes on sizes and distinguishing markings. Birds are the perfect hook for getting kids interested in nature and a window into that world is all you need to get them started on this wholesome, exciting lifelong hobby. Kelly Lenihan was forever making up stories, often writing them down, from childhood through her college years. After completing a general arts degree from the University of Washington, Kelly went on to enjoy a diverse range of creative endeavors, from fashion design and hand-painted pottery to web design and teaching global arts. Never losing her penchant for writing; she’s been published in various magazines and enjoyed her own newspaper column for several years. To this day, she is an avid blogger and has more children’s picture books in the works. Anya Macleod has been drawing and painting since she was a baby using a variety of medium including watercolours, acrylics and charcoal. Her inspiration comes from nature, with animals, the ocean, and plant life being some of her favorite subjects. She lives in Adelaide, Australia with her husband, daughter, giant dog and cat, but was born in Russia, moving with her family when she was 8. This was her first book illustrating project and she hopes to continue with both fiction and non-fiction illustrations.